Do you like to grow flowers and plants? You'll love your own greenhouse! A greenhouse maintains a growth promoting environment for plants through all four seasons so that the avid gardening hobbyist can enjoy gardening all year long. Many enthusiasts enjoy the daily springlike atmosphere within their home greenhouse as the winter rages just outside. They can take pride in an exotic flower bloom and benefit from countless hours of stress reduction in their "garden under glass". affords flexibility to the pursuit of a gardening hobby despite today's hectic schedules. While most people prefer to tend to their gardening in the daylight, others with less flexible schedules will be able to tend to their gardening in the evening. A greenhouse makes gardening possible all day and all year round. And, because of the demand for houseplants and flowers, many hobbyists are able to sell plants that they have grown themselves from cuttings, thus covering their greenhouse maintenance expenses such as heat, water, and materials. is on the south or southeast side of the house, in a sunny or partially shaded area. 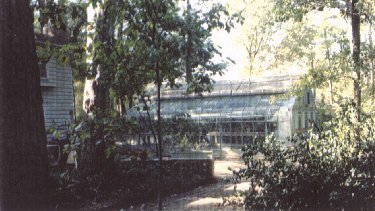 A southern exposure maximizes sunlight to the greenhouse during the winter when it is needed the most, and the home shelters it from the northern arctic blasts. A lean-to greenhouse model gets attached to the house, and may have a doorway from the greenhouse into the house and/or to the outside. 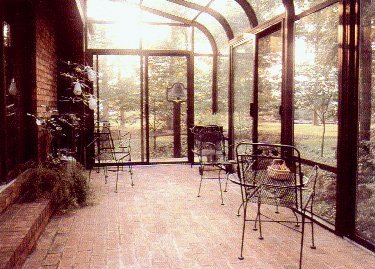 A freestanding greenhouse model, which affords more growing room, may be attached to the house at one end, or situated entirely away from the house. Is a very effective way of bringing the outdoors inside, improve your homes value and your quality of life. Most people enjoy the dramatic effect of opening up a room and living out in the open under a glass roof. This increases indoor living space while giving a modest sized room the appearance of being much larger. The increased light levels will brighten the area while reducing lighting costs. come prefabricated and ready to assemble. They are designed and manufactured to precise tolerances, and even the custom units require no cutting or fitting. Every unit comes ready for you to build your new "Garden Under Glass". 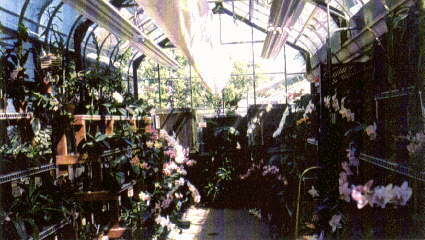 We specialize in horticultural greenhouses and sunrooms. 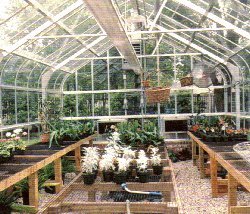 In business since 1961, we've served the Eastern US seaboard from Massachussetts to Maryland, building greenhouses for home hobbyists, institutions, and commercial businesses. Throughout these pages we hope you find enough information to make an informed decision in choosing the right greenhouse or sunroom for your needs.